Earlier this month, we noticed several different scans of Durbar Square in Kathmandu, that was hit by the large earthquake in spring 2015. In an ongoing initiative to document heritage sites, we invited the two teams to digitally reconstruct it in 3D, based on imagery before and after. Several organizations and companies contributed their knowledge and platforms to the project, which led to the development of new ways to document, store and present endangered or lost cultural heritage. 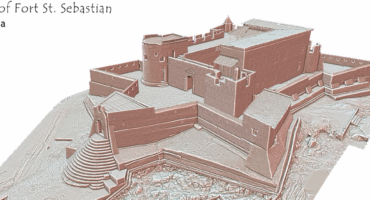 The German company nFrames created a 3D model from imagery of the site before the earthquake using software developments and their experience in 3D surface reconstruction from images. The images were acquired by the national aeronautics and space research center of Germany from Berlin using a special camera system called MACS from a high altitude. The 3D model after the earthquake was made by the company Drones Imaging from photos taken by an unmanned drone (UAS or RPAS) from close range. The alignment of both datasets over each other was done using the Sketchfab Viewer API enabling the documentation and visualization of the damage. Switch between the two views at any zoom level to see before and after views. This technology contributes to digitally preserving damaged cultural heritage while making it available for everyone to view. More before and after shots are on Drones Imaging blog. A larger initiative, Project Mosul provides a platform collecting 3D models of art and artifacts in danger due to political conflicts or natural hazards, relying on crowdsourced images and data. By visualizing lost landmarks, we can preserve their memory and possibly lead to the creation of an entirely interactive online museum. In another sense, we hope reconstructions like this could also help people rebuild the Durbar Square area of Kathmandu. Together, we are working on new ways of digital restoration and curation of lost heritage. It’s an inspiring use of the technology and we hope to see more!